"Hang on and watch your life take flight with FlyGirl!" 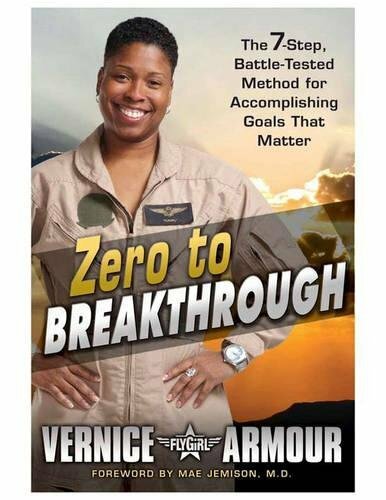 Before she was thirty years old, Vernice "FlyGirl" Armour had become a decorated naval aviator, Camp Pendleton's 2001 Female Athlete of the Year and Strongest Warrior winner, the first female African-American on Nashville's motorcycle police squad, and a member of the San Diego Sunfire professional women's football team. She's a force to be reckoned with, and she believes that women and men from all walks of life have the potential to achieve the highest levels of success with the right flight plan. In Zero to Breakthrough, Vernice turns aspiration into action by revealing how to create the path that will get you out of your rut on onto the runway - cleared for take off. Whether you want to jump up the corporate ladder, start your own business, or develop a passion into a livelihood, Zero to Breakthrough will get you there. For anyone seeking a more fulfilling life, Armour has the ultimate launch pad.